Before we continue on, it is probably good to get out of the way, what the thread trimmer is. In the picture (without text overlay) you can see a small elliptical like washer with a hex bolt in its center, and an arm below it, next to the feed dog, this is the thread trimmer (probably like a top “cap” [?]). Essentially the thread trimmer is a small cluster of bushings which are driven by a simple mechanism to control a small knife. 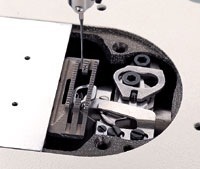 When the thread trimmer is activated it tells the knife to sweep across the thread – underneath the throat plate (or needle plate, what the material is running over, which has the grooves cut for the feed dog to pass by) – and trim the bobbin thread. How it trims the upper thread coming in from above is unclear. What a thread trimmer is good for is that; it saves a lot of time from having to constantly pull the fabric out and trim each side separateley (after your seem is made), it cuts very close to the fabric (probably closer than a human can), and it leaves the remaining thread at the optimal length to begin sewing again (this saves thread, and saves the person sewing from having to always pull a little excess out before laying down the next seem). 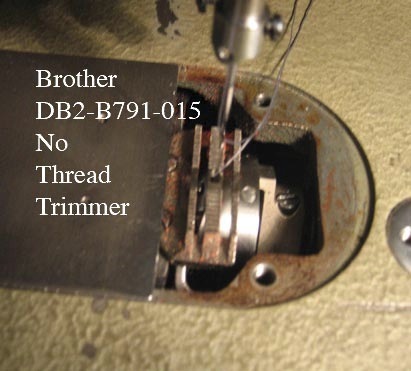 So does the Brother DB2-B791-015 not have a thread trimmer or are you implying in the text laid over the image that the Brother is not just a thread trimmer? ‘Thread trimmer’ in the latter scenario being used pejoratively. I think this distinction is necessary before continuing on – for one, it aligns your sympathies to one side or the other: either you are excited about the power and capability of the Brother DB2-B791-015 to be a creative engine and not simply an industrial workhorse limited/restrained to turning out the same forms continuously (much like those wonderful CNC machines who only get used to make TV dinner trays or speed forms), or you are simply letting it be known that the Brother is sans thread trimmer; secondly, we can be one step more in the light as to what kind of monster we have here (directed at both you and Brother)…for those of us who can’t detect from the image if a thread trimmer is present or not without the commentary.